• What are your target markets? 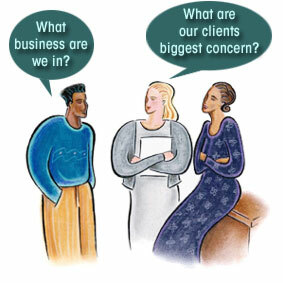 • What do your customers care about? 2. What are the priorities for the growth of your business? • What’s the desired outcome of your business marketing? • What is your business strategy? • What is your business marketing plan? 3. What are the barriers to growth? 4. What business marketing strategy, structure and actions will accelerate the growth of your company? • How can you build a steady stream of loyal customers and referrals? • What proven marketing ideas can you use? • How can you differentiate your services and products from your competitors? • How can you appeal to customers? •What’s the optimal marketing strategy for your services and or products? 5. What steps can you take immediately to improve the effectiveness of your business marketing? • How can your marketing plan help you increase the number of customers and their understanding of the range and value of their services? • How should you structure your use of media? • How can you you to help the search engines market your services?